When Terri Hancock launched the Paws for Tales reading program in 2009 at the Naperville Area Humane Society, she hoped it would have the power to change lives. 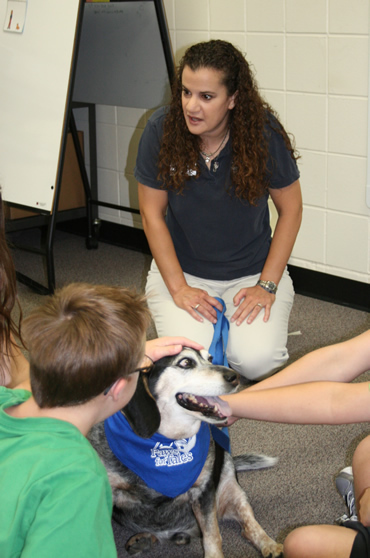 In 2012, Hancock and her dog, Cisco, brought the program to Crone Middle School to help students with special needs improve their social and academic skills. For her efforts, she is being recognized as the District 204 BMO Harris Bank Volunteer of the Month. Three years ago, Cisco was awaiting adoption at the shelter when Hancock, who is the Humane Education Manager at NAHS, got to know him. With his calm demeanor and patient disposition, she thought he would be a perfect match for the Paws for Tales reading program. Not only the children loved him, but she did, too, and adopted him. Cisco is also the reason that Hancock learned about Crone. She and her neighbor, Beth Kinane, who is a special education teacher at the school, met while walking their dogs. “I had mentioned the fact that I do the Paws for Tales program in schools with Cisco,” Hancock said. The school wanted to develop a program that would help special needs students work on their social skills, while improving their academic skills. Kinane thought Paws for Tales would be a great fit at Crone and received the approval from Principal Allan Davenport. The Paws for Tales program uses books that encourage children to treat others, both people and animals, with respect and kindness. The students feel more comfortable reading aloud to a calm dog, knowing that the canine will never judge their skills. During the sessions at Crone, students read to Cisco, talk to him and sometimes just hug him.